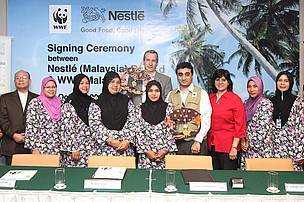 In an initiative in supporting the conservation efforts in the Setiu Wetlands in Terengganu, leading Nutrition, Health and Wellness company, Nestlé (Malaysia) Bhd, extend the partnership into the second phase with WWF-Malaysia and aims to continue building the capacity of the local women, who refer to themselves as Pengusaha Wanita Setiu (PEWANIS), with further skills and knowledge to participate in sustainable development activities such as low-impact , community-based nature tourism and cottage industry that will enhance their livelihoods while empowering them to spearhead conservation awareness activities in their role as environmental guardians of the Setiu Wetlands. 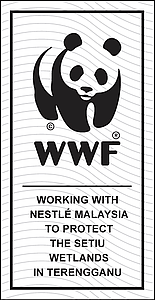 Under the terms of this second phase of the partnership covering a 3-year period, Nestlé and WWF-Malaysia will focus their collaboration on strengthening the foundation established in the earlier phase in terms of mainstreaming of women into biodiversity conservation and sustainable development, extending outreach and increasing participation of other communities in the area, as well as diversifying options for additional income. This phase will lead to expansion of the project into a model to be replicated in other communities as well as for it to be fully sustainable in the long run. The Setiu wetlands, in northern Terengganu, are the largest and most intact coastal wetland complex on the east coast of Peninsular Malaysia and are home to the world’s last viable population of critically endangered painted terrapins (Batagus borneoensis) and significant populations of nesting green turtles (Chelonia mydas). Collectively, the local community of an area can be the most important driver in slowing down and reducing the loss of biodiversity and protecting the main flagship species within the landscape. If the community is made aware, is educated, and is provided with specific skills towards conservation of species and the ecosystem, and then shown how this is linked towards generation of local benefits, this community will be more interested in being actively engaged in community-based initiatives. This, in turn encourages biodiversity conservation and protection of main flagship species of the area. 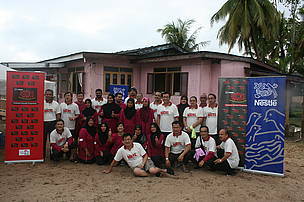 In 2006, Nestlé (Malaysia) Bhd began a project with WWF-Malaysia in Kampung Mangkok, Setiu, a coastal village in Terengganu, aimed at improving the livelihood of local communities through a sustainiable development programme that empowers local women while engaging them in environmental conservation. Emphasis was put on the women because, as mothers and co-income earners, they had an important role to play in the area’s long-term development in a sustainable manner. Pengusaha Wanita Setiu (PEWANIS), or the Setiu Women Entrepreneurs, a registered organization, comprising women from Kampung Mangkok, Penarik in Setiu was then established in November 2007. The goal is to empower the women to become their home’s environmental guardians to conserve the mangroves, wetlands, turtles and terrapins in Setiu.